There’s an outdated (and potentially dangerous) practice that promoted cleaning cooking grates by laying aluminum foil on the grates, turning the grill to high, and letting it run for a while. This is a major NO-NO. Laying the foil on the grates can restrict the intended air flow inside the grill, which could lead to damage of the internal components, not to mention create a dangerous situation. 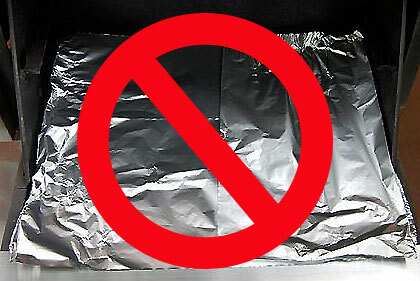 Also, on the topic of aluminum foil, is the practice of lining the slide out bottom tray with aluminum foil. This is usually done as a time saving method for cleaning, so one does not have to manually clean the bottom tray, rather, they can just pull out the foil and line it with new foil, as needed. The problem with this is that the bottom tray on our grills is specifically designed to maximize the flow of grease to the catch pan. If you’ve ever lined something with foil you’ll probably remember that doing so creates all sorts of ridges and creases in the foil, as few people could be bothered to sit there and smooth out each ridge and crease. 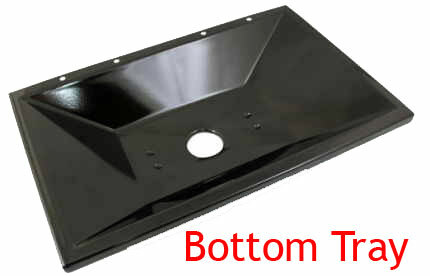 Those ridges and creases all create barriers to the proper flow of grease to the catch pan, which sets the stage for lots of it to build up on the bottom tray, which in turn, builds the potential for grease fires and flare ups. Foil does have useful applications in our grills though, and works well as a makeshift smoker packet. It’s also great for wrapping up vegetables, ribs, fish and other foods for a different method of cooking on the grill.